Altarpiece from the Carthusian monastery of Saint-Honoré, Thuison-les-Abbeville, France, depicting Saint Hugh of Lincoln with his swan. The first tincture of the mind is of the utmost importance to virtue; and it was the happiness of this saint to receive from his cradle the strongest impressions of piety by the example and care of his illustrious and holy parents. He was born at Chateau-neuf, in the territory of Valence in Dauphiné, in 1053. His father, Odilo, served his country in an honourable post in the army, in which he acquitted himself of his duty to his prince with so much the greater fidelity and valour, as he most ardently endeavoured to sanctify his profession and all his actions by a motive of religion. Being sensible that all authority which men receive over others is derived from God, with an obligation that they employ it, in the first place, for the advancement of the divine honour, he laboured, by all the means in his power, to make his soldiers faithful servants of their Creator, and by severe punishments to restrain vices, those especially of impurity and lying. By the advice of his son, St. Hugh, he afterward became a Carthusian monk, when he was upwards of fourscore years old, and lived eighteen years in great humility and austerity under St. Bruno, and his successors, in the great Chartreuse, where he died one hundred years old, having received extreme unction and the viaticum from the hands of his son. Our saint likewise assisted, in her last moments, his mother, who had for many years, under his direction, served God in her own house, by prayer, fasting, and plenteous alms-deeds. Hugh, from the cradle, appeared to be a child of benediction. He went through his studies with great applause, and his progress in piety always kept pace with his advancement in learning. Having chosen to serve God in an ecclesiastical state, that he might always dwell in his house and be occupied in his praises, he accepted a canonry in the cathedral of Valence. In this station, the sanctity of his life, and his extraordinary talents, rendered him the ornament of that church; and the gentleness and affability of his deportment won him the affection of all his colleagues. He was tall, and very comely, but naturally exceedingly bashful; and such was his modesty, that, for some time, he found means to conceal his learning and eloquence: nevertheless, his humility served only to show afterward those talents to more advantage and with greater lustre. For no virtue shines brighter with learning than modesty, as nothing renders scholars more odious or despicable than haughtiness and pride, which they discover by their obstinacy and clamours, by the contempt with which they treat those who dissent from them in opinion, and by their ostentatious pedantry in embracing every occasion of exhibiting their supposed superior wit and extraordinary parts. 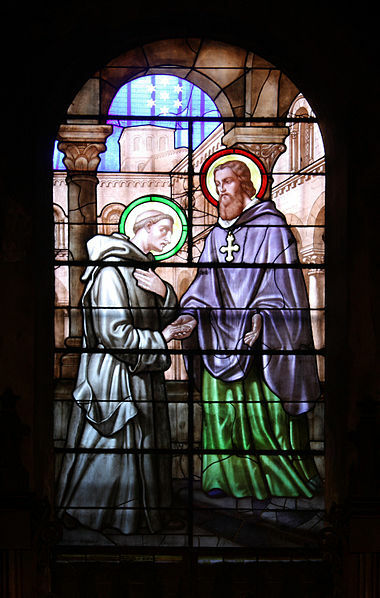 Hugh, then bishop of Die, but soon after archbishop of Lyons, and also cardinal legate of the holy see, was so charmed at first sight of the saint, when he happened to come to Valence, that he would not be contented till he had taken the good man into his household. He employed him in extirpating simony, and in many other affairs of importance. In 1080, the legate Hugh held a synod at Avignon, in which he took under consideration the desolate condition and the grievous disorders into which the church of Grenoble was sunk, through the sloth and bad example of its late mercenary pastor. The eyes of the legate and of the whole council were fixed on St. Hugh as the person best qualified, by his virtue and prudence, to reform these abuses, and restore the ancient glory of that church; and with them the voice of the whole city conspired. But his reluctance and fears were not to be overcome till he was compelled by the repeated commands of the legate and council. The legate took our newly appointed bishop with him to Rome, in order to his receiving the episcopal consecration from the hands of Gregory VII, who then sat in the chair of St. Peter. The servant of God was glad of this opportunity of consulting the vicar of Christ concerning his own conscience; for, during a great part of his life, he had been extremely molested with troublesome temptations of importunate blasphemous thoughts against the divine providence. Pope Gregory, who was a man very well versed in the interior trials of souls, assured him that this angel of Satan was permitted by God, in his sweet mercy, to buffet him only for his trial and crown: which words exceedingly comforted the saint, and encouraged him to bear his cross with patience and joy. A devout soul, under this trial, which finds these suggestions always painful and disagreeable, ought not to lose courage; for by patience and perseverance she exceedingly multiplies her crowns, and glorifies God, who has laid it upon her shoulders, and who will, when he sees fit, scatter these mists, and on a sudden translate her from this state of bitterness and darkness into the region of light, joy, and the sweetest peace. St. Hugh prayed earnestly to be freed from this enemy; but received for a long time the same answer with St. Paul. In the mean while, his patience and constancy were his victory and his crown: and assiduous meditation on the sufferings of our divine Redeemer, who was made for us a man of sorrows, was his comfort and support. The pious Countess Maud would needs be at the whole charge of the ceremony of his consecration: she also gave him a crosier and other episcopal ornaments, with a small library of suitable books, earnestly desiring to be instructed by his good counsels, and assisted by his prayers. 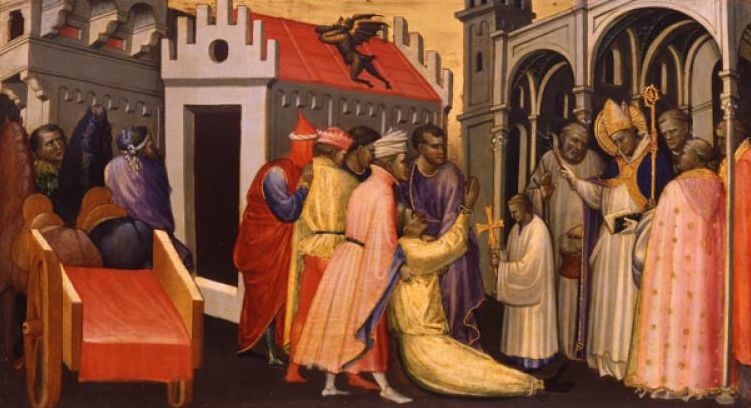 St. Hugh, after his ordination, hastened to his flock; but being arrived at Grenoble could not refrain his tears, and was exceedingly afflicted and terrified when he saw the diocese overrun with tares which the enemy had sown while the pastor slept. He found the people in general immersed in a profound ignorance of several essential duties of religion, and plunged in vice and immorality. Some sins seemed by custom to have lost their name, and men committed them without any scruple or sign of remorse. The negligence and backwardness of many in frequenting the sacraments, indicated a total decay of piety, and could not fail introducing many spiritual disorders in their souls, especially a great lukewarmness in prayer and other religious duties. Simony and usury seemed, under specious disguises, to be accounted innocent, and to reign almost without control. Many lands belonging to the church were usurped by laymen; and the revenues of the bishopric were dissipated, so that the saint, upon his arrival, found nothing either to enable him to assist the poor, or to supply his own necessities, unless he would have had recourse to unlawful contracts, as had been the common practice of many others, but which he justly deemed iniquitous; nor would he by any means defile his soul with them. He set himself in earnest to reprove vice, and reform abuses. To this purpose he endeavoured by rigorous fasts, watchings, tears, sighs, and prayer, to draw down the divine mercy on his flock. And so plentiful was the benediction of heaven upon his labours, that he had the comfort to see the face of his diocese in a short time exceedingly changed. After two years, imitating therein the humility of some other saints, he privately resigned his bishopric, presuming on the tacit consent of the holy See; and putting on the habit of St. Bennet, he entered upon a novitiate in the austere abbey of Chaise-Dieu, or Casa-Dei, in Auvergne, of the reformation of Cluny. There he lived a year a perfect model of all virtues to that house of saints, till Pope Gregory VII commanded him in virtue of holy obedience to resume his pastoral charge. Coming out of his solitude, like another Moses descending from the conversation of God on the mountain, he announced the divine law with greater zeal and success than ever. The author of his life assures us that he was an excellent and assiduous preacher. Saint Hugh, bishop of Grenoble, receiving St. Bruno, founder of the Carthusian order. The seven stars represent Saint Hugh’s dream, telling him where to guide Bruno and his six companions in order to found the Grande Chartreuse monastery. St. Bruno and his six companions addressed themselves to him for his advice in their pious design of forsaking the world, and he appointed them a desert which was in his diocese, whither he conducted them in 1084. It is a frightful solitude, called the Chartreuse, or Carthusian mountains, in Dauphiné, which place gave name to the famous Order St. Bruno founded there. The meek and pious behaviour of these servants of God took deep root in the heart of our holy pastor; and it was his delight frequently to visit them in their solitude, to join them in their exercises and austerities, and perform the meanest offices amongst them, as an outcast and one unworthy to bear them company. Sometimes the charms of contemplation detained him so long in this hermitage, that St. Bruno was obliged to order him to go to his flock, and acquit himself of the duties which he owed them. He being determined to sell his horses for the benefit of the poor, thinking himself able to perform the visitation of his diocese on foot, St. Bruno, to whose advice he paid an implicit deference, opposed his design, urging that he had not strength for such an undertaking. For the last forty years of his life he was afflicted with almost continual headaches, and pains in the stomach; he also suffered the most severe interior temptations. Yet God did not leave him entirely destitute of comfort; but frequently visited his soul with heavenly sweetness and sensible spiritual consolations, which filled his heart under his afflictions with interior joy. The remembrance of the divine love, or of his own and others’ spiritual miseries, frequently produced a flood of tears from his eyes, which way soever he turned them; nor was he able sometimes to check them in company or at table, especially whilst he heard the holy Scriptures read. In hearing confessions, he frequently mingled his tears with those of his penitents, or first excited theirs by his own. At his sermons it was not unusual to see the whole audience melt into tears together; and some were so strongly affected, that they confessed their sins publicly on the spot. After sermon, he was detained very long in hearing confessions. He often cast himself at the feet of others, to entreat them to pardon injuries, or to make some necessary satisfaction to their neighbours. His love of heavenly things made all temporal affairs seem to him burdensome and tedious. Women he would never look in the face, so that he knew not the features of his own mother. He never loved to hear or relate public news or reports, for fear of detraction, or at least of dissipation. His constant pensioners and occasional alms (in the latter of which he was extremely bountiful) were very expensive to him: insomuch, that though, in order to relieve the poor, he had long denied himself everything that seemed to have the least appearance of superfluity, still, for the extending his beneficent inclination, he even sold, in the time of famine, a gold chalice, and part of his episcopal ornaments, as gold rings and precious stones. And the happy consequence of St. Hugh’s example this way was, that the rich were moved by it to bestow of their treasures to the necessitous, whereby the wants of all the poor of his diocese were supplied. He earnestly solicited Pope Innocent II for leave to resign his bishopric, that he might die in solitude; but was never able to obtain his request. God was pleased to purify his soul by a lingering illness before he called him to himself. Some time before his death, he lost his memory for everything but his prayers: the Psalter and the Lord’s Prayer he recited with great devotion, almost without intermission: and he was said to have repeated the last three hundred times in one night. Being told that so constant an attention would increase his distemper, he said, “It is quite otherwise: by prayer I always find myself stronger.” In the time of sickness, a certain frowardness and peevishness of disposition are what the best of us are too apt to give way to, through weakness of nature and a temptation of the enemy, who seeks to deprive a dying person of the most favourable advantages of penance and patience, and to feed and strengthen self-love in the soul while upon the very cross itself, and in the crucible into which she is thrown by a singular mercy, in order to her coming forth refined and pure. In this fiery trial, the virtue of the saints shows itself genuine, and endued with a fortitude which renders it worthy its crown. By the same test is pretended virtue discovered: self-love can no longer disguise itself: it cries out, murmurs, frets, and repines: the mask which the hypocrite wore is here pulled off: saints, on the contrary, under every degree of torture cruelty can invent, preserve a happy patience and serenity of soul. Hence the devil would not allow the virtue of Job to be sincere before it had been approved under sickness and bodily pain. St. Hugh left us by his invincible patience a proof of the fervour of his charity. Under the sharpest pains, he never let fall one word of complaint, nor mentioned what he suffered: his whole concern seemed only to be for others. When any assisted him, he expressed the greatest confusion and thankfulness: if he had given the least trouble to any one, he would beg to receive the discipline, and because no one would give it him, would confess his fault, as he called it, and implore the divine mercy with tears. The like sentiments we read of in the relation of the deaths of many holy monks of La Trappe. Dom. Bennet, under the most racking pains, when turned in his bed, said: “You lay me too much at my ease.” Dom. Charles would not cool his mouth with a little water in the raging heat of a violent fever. Such examples teach us at least to blush at and condemn our murmurs and impatience under sickness. The humility of St. Hugh was the more surprising, because every one approached him with the greatest reverence and affection, and thought it a happiness if they were allowed in anything to serve him. 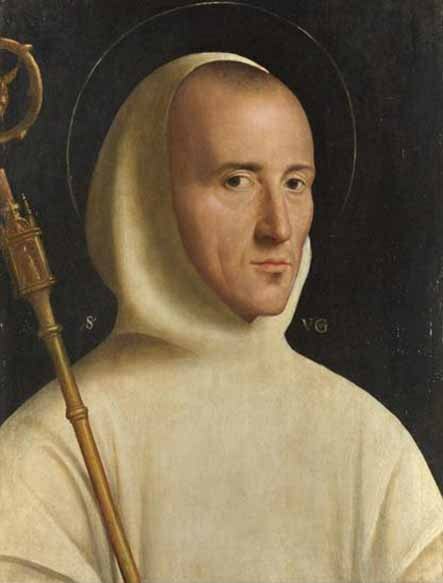 It was his constant prayer, in which he begged his dear Carthusians and all others to join him, that God would extinguish in his heart all attachment to creatures, that his pure love might reign in all his affections. One said to him: “Why do you weep so bitterly, who never offended God by any wilful crime?” He replied: “Vanity and inordinate affections suffice to damn a soul. It is only through the divine mercy that we can hope to be saved, and shall we ever cease to implore it?” If any one spoke of news in his presence, he checked them, saying: “This life is all given us for weeping and penance, not for idle discourses.” He closed his penitential course on the 1st of April, in 1132, wanting only two months of being eighty years old, of which he had been fifty-two years bishop. Miracles attested the sanctity of his happy death; and he was canonized by Innocent II in 1134. 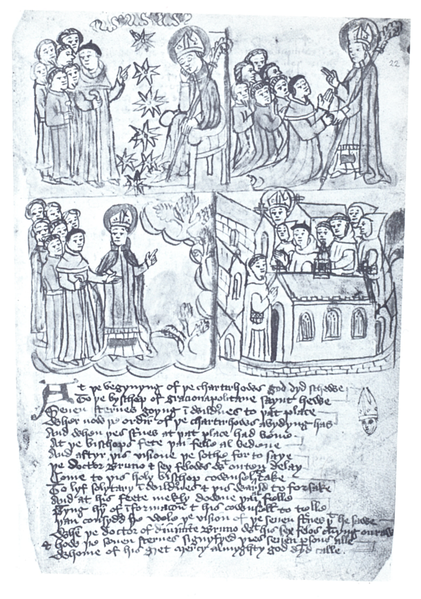 The four drawings depict the role of St. Hugh, Bishop of Grenoble, in the founding of the mother-house of the Carthusian Order, the Grand Chartreuse. In the first image St. Hugh, sits on his Episcopal throne, had a dream about the seven stars. These fall to the ground. In the next scene, Hugh relates the dream to the seven who kneel in front of him. He then directs the group to a forest. Finally, the Carthusian monks, arrayed in their distinctive white robes, enter the monastery they have built. There is no saint who was not a lover of retirement and penance. Shall we not learn from them to shun the tumult of the world, as much as our circumstances will allow, and give ourselves up to the exercises of holy solitude, prayer, and pious reading? Holy solitude is the school of heavenly doctrine, where fervent souls study a divine science, which is learned by experience, not by the discourses of others. Here they learn to know God and themselves; they disengage their affections from the world, and burn and reduce to ashes all that can fasten their hearts to it. Here they give earthly things for those of heaven, and goods of small value for those of inestimable price. In blessed solitude, a man repairs in his soul the image of his Creator, which was effaced by sin, and, by the victory which he gains over his passions, is in some degree freed from the corruption of his nature, and restored in some measure to the state of its integrity and innocence by the ruin of vice, and the establishment of all virtues in his affections; so that, by a wonderful change wrought in his soul, he becomes a new creature, and a terrestrial angel. 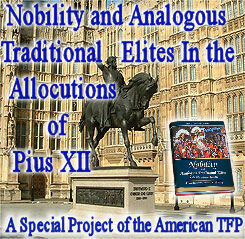 His sweet repose and his employments are also angelical, being of the same nature with those of the blessed in heaven. By the earnest occupation of the powers of his soul on God and in God, or in doing his will, he is continually employed in a manner infinitely more excellent and more noble than he could be in governing all the empires of the world; and in a manner which is far preferable to all the vain occupations of the greatest men of the world during the whole course of their lives. Moreover, in the interior exercises of this state, a soul receives certain antepasts of eternal felicity, by which she intimately feels how sweet God is, and learns to have no relish for anything but for him alone. O my friends, cried out a certain pious contemplative, I take leave of you with these words, and this feeling invitation of the Psalmist: Come, taste yourselves, and see by your own experience how sweet the Lord is. But these and other privileges and precious advantages only belong to the true solitary, who joins interior to exterior solitude, is never warped by sloth or remissness, gives no moments to idleness, uses continual violence to himself, in order perfectly to subdue his passions, watches constantly over his senses, is penetrated to the heart with the wholesome sadness of penance, has death always before his eyes, is always taken up in the exercises of compunction, the divine praises, love, adoration, and thanksgiving, and is raised above the earth and all created things by the ardour of his desires of being united to God, the sovereign good. Note 1. 2 Cor. xii. 9. Note 2. St. Hugh is ranked among ecclesiastical writers, chiefly on account of his Chartulary, or collection of Charters, with curious historical remarks, kept in MS. at Grenoble: from which Dom. Maur. d’Antine has borrowed many things in his new edition of Du Cange’s Glossary, etc. Note 3. Job xi. 5. From his life, written two years after his decease, by his intimate friend Guigo, fifth prior of the great Chartreuse, by the order of Pope Innocent II. Bollandus ad Apr. 1. p. 36. Mabillon, Annal. 1. 66. n. 34. Pagi ad An. 1080. Hist. Liter. de la France, t. 11. p. 149. The Lives of the Saints, Vol. IV: March, by Rev. Alban Butler (New York: D.&J. Sadlier Publishers, 1866), pp. 5-9.